Bill George: This is a short film showing the process of the detail paint work on the conservation of the original U.S.S. Enterprise miniature, used in all 79 episodes of the original Star Trek television series. The detail paint work was done between the 11th and the 23rd of April 2016 at the Smithsonian National Air and Space Museum’s Steven F. Udvar-Hazy Center in Chantilly, Virginia. 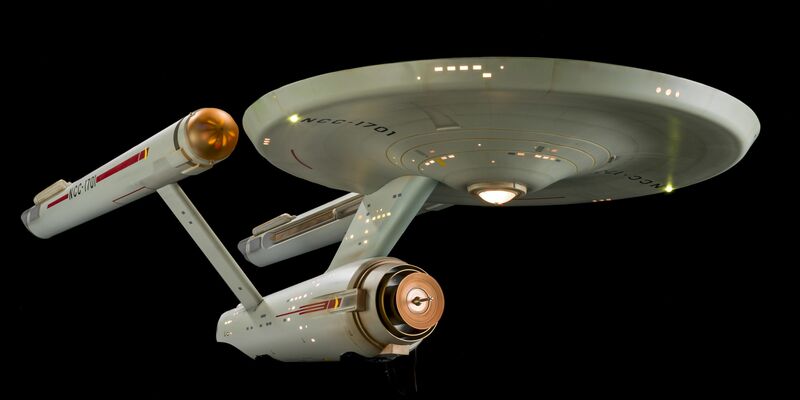 The model is now on display in the Boeing Milestones of Flight Hall at the National Air and Space Museum in Washington D.C.
Bill’s channel also has this fascinating video with the original ‘library shots’ of the Enterprise model. The Star Trek editors would choose shorter sections of these longer shots to use in the various episodes. Update: At first I thought that the image used in the thumbnail for the video looked so good that it must have been computer generated, but of course that would be a travesty. It is in fact a beauty shot of the restored model, presented below in high resolution [4000 × 2000 pixels].